One thing about working with synethic aperture radar (SAR) data is that regular image processing functions are often unsuitable. This is because most processes were design to deal with issues related to passive multispectral data in the visible-thermal infrared wavelength range. SAR imagery is derived from an active sensor which introduces particular problems or rather requires special solutions. The wavelength range is also very different meaning that the interaction between the energy and target is dissimilar to that of visible-infrared radiation. Hence we need a different set of tools to work with SAR data. If you have the money there are excellent commercial packages available including PCI Geomatica, ENVI-SARScape, and Gamma. All of these provide powerful SAR processing solutions. However, if you want to save money there are Freeware alternatives. Here it is important to point out that there is a difference between Open Source and Freeware; the former freely distributes the source code while the latter is free to use but may not allow users access to the source code. There are four SAR packages widely available that provide excellent image processing tools for free. Map Ready is distributed by the Alaska Satellite Facility. It is free but not open and may be restricted if you happen to live in a country with poor relations to the US (currently including Iran, North Korea, Sudan and Cuba i believe). Otherwise Map Ready offers a range of processing options including full radiometric correction of terrain effects using the Ulander (1996) approach. This is undoubtedly the programs greatest asset. Map Ready offers data calibration a few polarimetric decompositions for users with quad-pol data and the ability to import data processed using PolSARPro. PolSARPro is a package offered freely by the European Space Agency. The package provides polarimetric processing tools for Dual and Quad-pol SAR data. Developed under the leadership of Eric Pottier the contributors of PolSARPro reads like a ‘Who’s Who’ of PolSAR (Ainsworth, Boerner, Lee, Touzi, Cloude…). Incidently, it is also an excellent example of how a diverse, international group can collaborate for the good of the community. 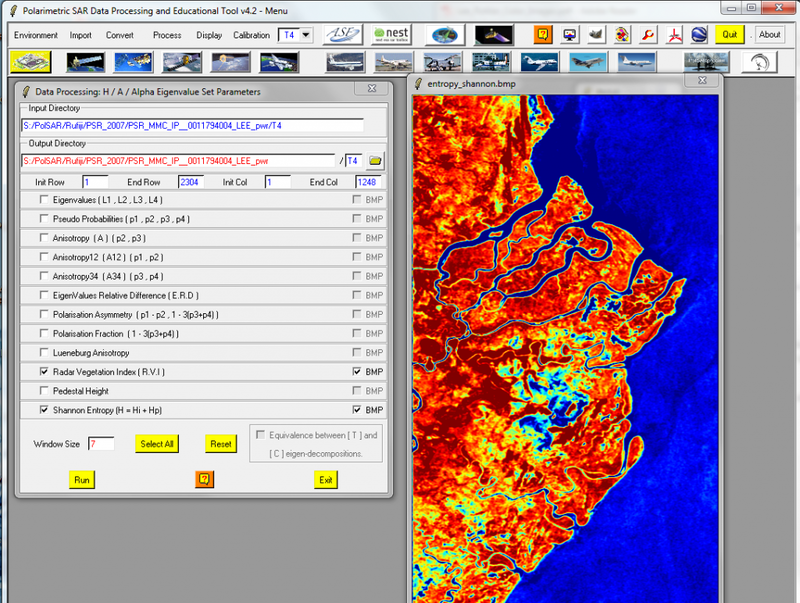 PolSARPro is THE tool for polarimetric SAR processing. It is relatively simple to use and there is extensive support material (including background material on SAR polarimetry). 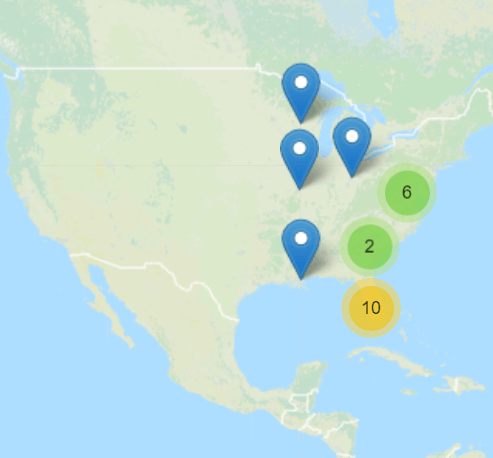 PolSARPro does not offer terrain correction but does offer a connection to ASF’s Map Ready so if that program is installed you can seamlessly correct your PolSARPro products in Map Ready. The PolSARPro interface showing an ALOS PALSAR Shannon Entropy image over the Rufiji Delta, Tanzania. ESA also offers the Next ESA SAR Toolbox (NEST) produced under contract by Array Systems. NEST offers SAR image processing using the BEAM platform developed to support MERIS and other optical imagery. NEST is the cousin of PolSARPro offering a range of calibration, filtering and analysis functions. It also offers terrain correction but only of ENVISAT data (and in my experience only on sunny days when the moon is in the fourth quarter and pisces is in the ascendent). Actually, my latest installation of NEST doesn’t work so I am not able to properly report on the latest version. Finally, there is Radar Tools (RAT). Originally developed at TU Berlin the program is largely supported by Andreas Reigber at the German Aerospace Agency, DLR. How he manages to find the time to support RAT whilst running one of the World leading SAR technology development teams is beyond me, but he does (actually I think DLR have managed to warp space-time to add a few more hours to the day). RAT offers a wide range of SAR image processing tools, many of which do not appear in any other package (commercial or free). RAT offers routines for SAR image processing and analysis and polarimetric, interferometric, and PolInSAR processing. As such it goes beyond almost any other package (and certainly any freeware) in the range of processing available. 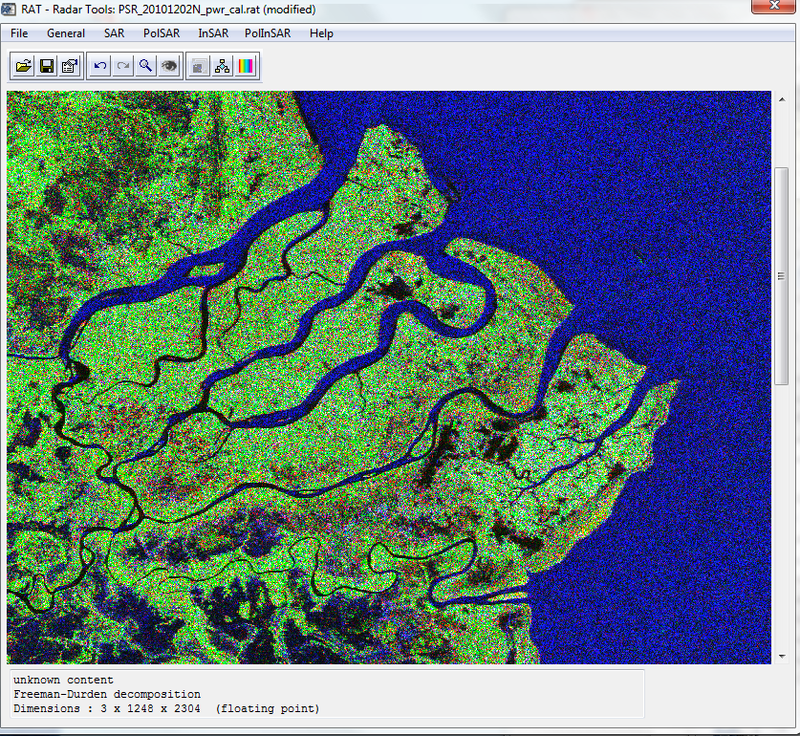 The RAT interface showing a Freeman-Durden decomposition of an ALOS PALSAR image over the Rufiji delta. My personal favourite is RAT. The graphics are excellent, the processing options extensive and the science behind it rigorous. PolSARPro is the choice for polarimetry whilst Map ready and NEST both have their strengths in terrain correction and (intensity) image analysis, respectively. Cobined RAT and PolSARPro offer almost everything one can need, particularly if coupled with Map Ready’s terrain correction functionality. Freeware for SAR is therefore not only available but is a powerful alternative to commerical SAR processing software. Ulander, L.M.H., 1996. Radiometric slope correction of synthetic-aperture radar images. IEEE Transactions on Geoscience and Remote Sensing, 34(5): 1115 – 1122.